Item is a simple camera for 50 exposures ( 24x24mm ) on regular 35mm film . 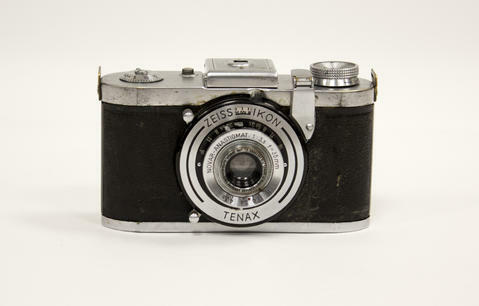 It was built 1939 t0 1941, the low serial No indicates a small production of this camera , possibly because of the war. The foldable lever transported the film and cocked the Compur shutter. The lens is a non exchangeable Zeiss Novar Anastigmat 1:3.5 with a focal length of 35mm. The Viewfinder is a simple Newton finder , it is folded onto the body Focusing by front lens in a simple helical mounting.